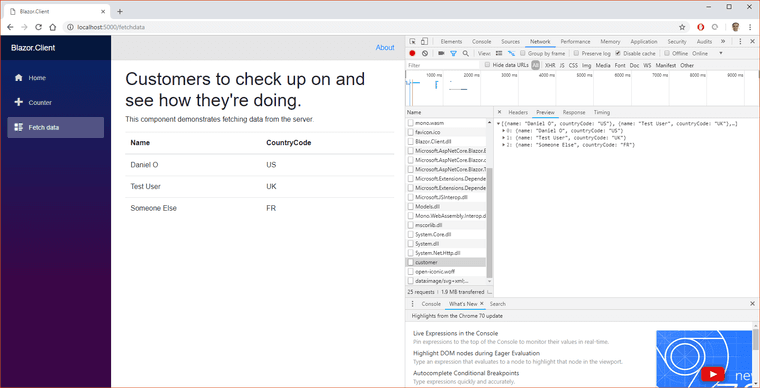 Blazor is an exciting new way for C# developers to build a UI in the web with HTML. To get started most easily, install the Blazor templates available. Restore completed in 986.04 ms for C:\Users\Daniel\.templateengine\dotnetcli\v2.1.403\scratch\restore.csproj. 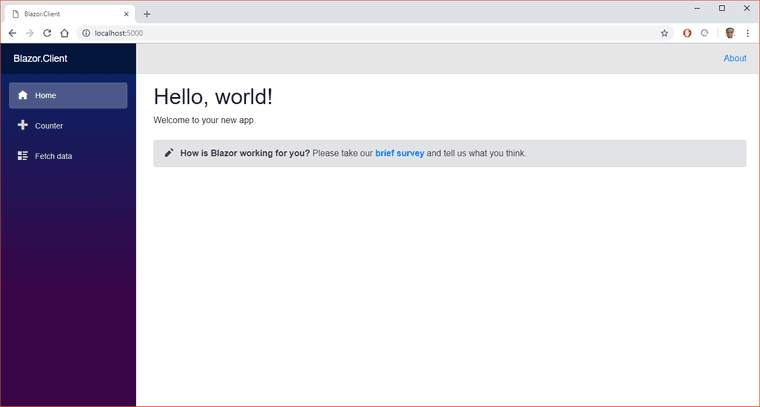 I'm going to create a new Blazor solution. Awesome! I can run a default project. To the Models project, add a new class called "Customer". Nothing fancy, just enough for something to exist. Now to the API project, I'm adding a controller that uses the above model to return a list of customers, as well as a single customer if wanted. For ease of use, add the following snippet to Startup.cs inside the "Configure" method. And change Program.cs to use this method, which will run the API on a different port than the Blazor project is running on. Back in the Blazor project, there's a page that fetches data. Let's change that page to use the shared model, and to call the API from above. This is a fantastic concept. I could write a shared model library, and it could be the same models that both server and client side use. Now this has been advocated before in the .NET world, such as by the efforts of the F# based SAFE Stack. A huge benefit for using the same model is being more confident in type safety, not to mention being able to "find all references" on a class in C#. Blazor is well worth looking into. The official docs or Learn Blazor are both fantastic resources. My example code from above is here.